For without words, in friendship, all thoughts, all desires, all expectations are born and shared, with joy that is un acclaimed. and I felt I wanted to share it here and now. So glad that you too have enjoyed the mighty wisdom of KG. A wonderful photo to go with a beautiful poem. LOL you have a question Bill? Absolutely Lynne and the last line is a treasure to behold. Thank You for visiting Mitch. 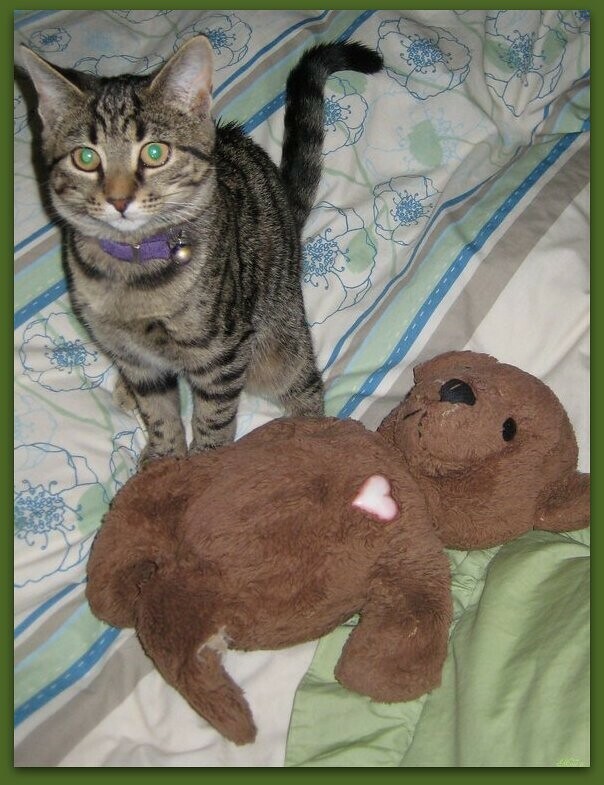 The photo is of Mini and the bear and I just love the colour of Mini's eyes. She ofcourse, loves her little bear friend. "And in the sweetness of friendship let there be laughter, and sharing of pleasures. For in the dew of little things the heart finds its morning and is refreshed"
Thanks for visiting my friends. Awww, what a sweet kitty. Looks like a young Sparkie, is s/he a bronze Egyptian Mau? Cute kitty cat. I love Gibran. "The Prophet" is one of my favorite books. He makes any word sound beautiful. Kahlil Gibran must have experienced true friendship! Great blog again, Millie!